Since the recession started in 2008, churches have been learning to navigate troubled financial waters that are unprecedented in our lifetime. 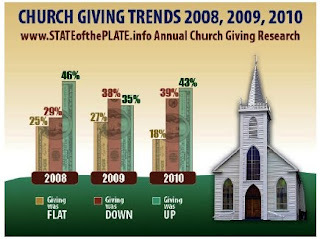 The third annual STATE of the PLATE, a collaborative research project by Brian Kluth’s Maximum Generosity ministry, Christianity Today International, publisher of Church Finance Today and Leadership journal, and the Evangelical Council for Financial Accountability (ECFA) received responses from a record 1,507 churches of all sizes, theological leanings, and from every region of the country. 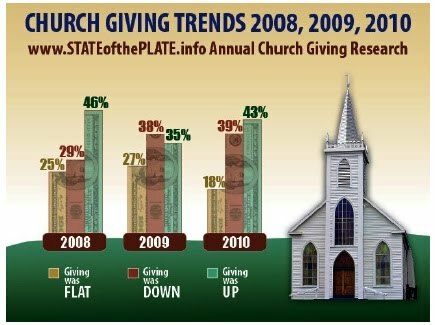 The survey asked church pastors, staff, and leaders to report on their church giving, budgeting, generosity initiatives, and programs to help families negatively affected by the economy. In the latest research, released on March 30, 2011, four major trends emerged. Please click here to read the entire report.